GT Masters is one of the biggest and most competitive GT3 championships in the world and the final round in Hockenheim took place this weekend. At the start of the final race of the season, Dries Vanthoor made a slightly optimistic move at the first corner to try and take the lead from Maximilian Götz. However, the two cars collided and both were out, along with a few others. To make matters worse, Götz was a championship contender. This is where things get good. 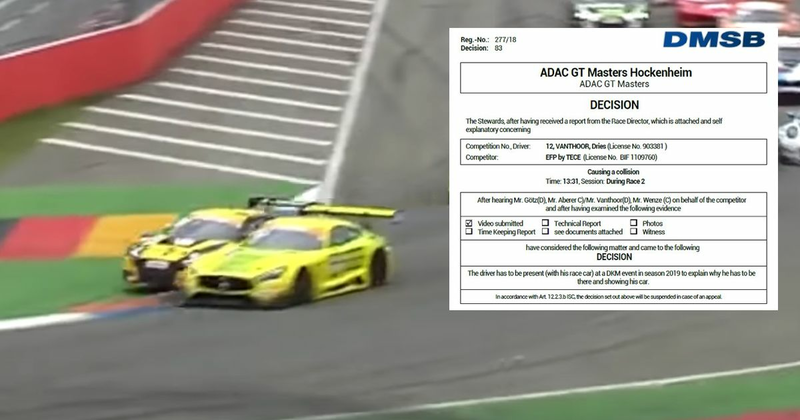 Stewards decided they couldn’t give Vanthoor a grid penalty for the next race or even a race ban - after all, it was the last race of the season. Instead, they came up with one of the most unusual and innovative punishments we’ve seen. To atone for his sins, Vanthoor must take his car to a round of the German Karting Championship next year and give a talk to young, up-and-coming racers about what he did and why it was wrong. No, really! How good is that!? A frequent criticism of driver penalties in motorsport is that bad driving isn’t punished heavily enough. If professional drivers can get off lightly with overly-aggressive moves, forcing other drivers off track or even hitting people on purpose, then what’s to stop younger drivers from doing the same? This punishment is kinda like the motorsport equivalent of a criminal going to a school and trying to scare kids onto the straight and narrow. It’s a great idea and we’d love to see this sort of thing tried in F1. Maybe Sergio Perez could give a seminar on how to use mirrors properly, or the FIA could make Marcus Ericsson host a TED Talk on why he took Romain Grosjean out in Azerbaijan?